It’s the 24th day of ISIS attacks on Kobanê. While people’s defending forces in all border villages are on human shield sentry for Kobanê against attacks, everyone, everywhere in the region we live, rised up not to let Kobanê fall. 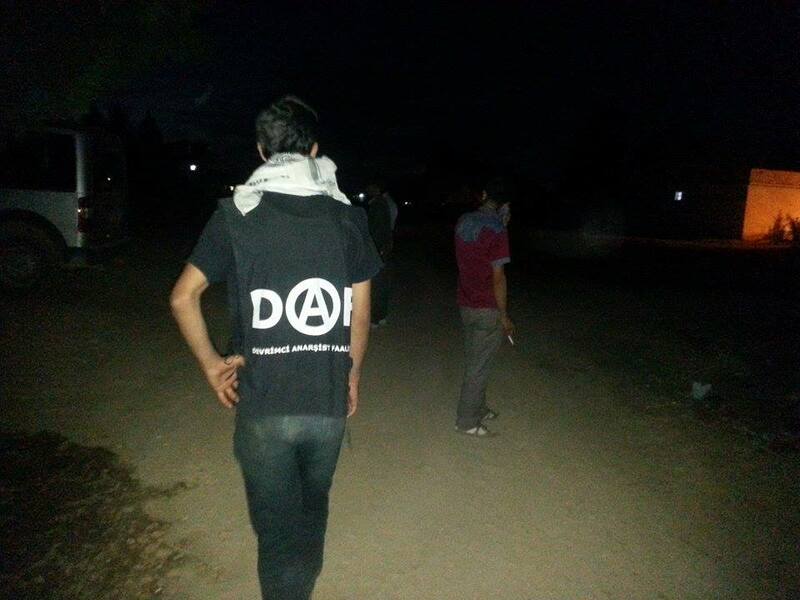 We have been on human shield sentry for around three weeks in Boydê village west of Kobanê. In the last two days, explosions and sounds of clashes got intense in Kobanê’s outer districts and town center. During this period of intense clashes, military forces increased their attacks on human shield sentries at border villages. Soldiers of Turkish State has been attacking with gas bombs to those who approach the border from both sides, including the village that we are in, which was attacked on Tuesday. Soldiers also used live ammunition from time to time in their attacks and wounded people. These attacks on border villages especially mean that ISIS forces are allowed passage through the border. Republic of Turkey’s support to ISIS is clearly visible here as it is there. Of course that’s not the only thing that is clear. 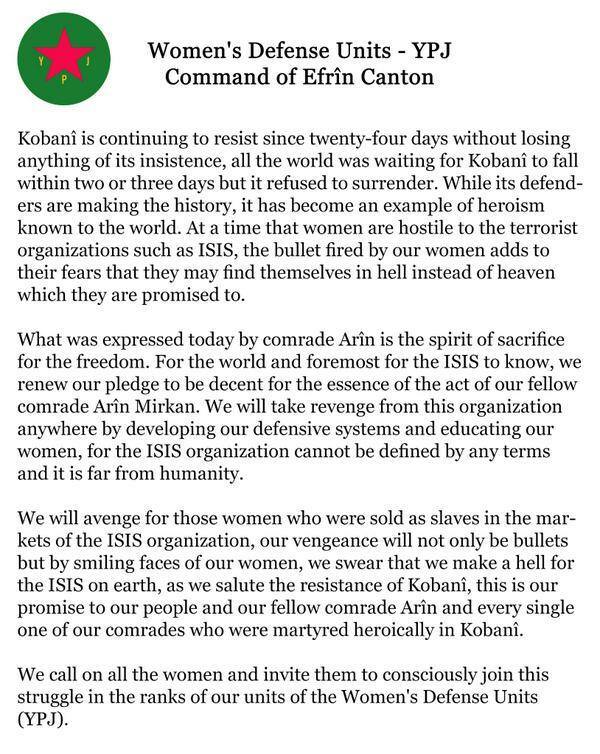 We have learned that one of the ISIS leaders commanding the attack on Kobanê got killed by YPJ/YPG forces. Meanwhile clashes today are as intense as before and continued all day long. Sounds of clashes almost never stopped today. However now we know that explosions are made by YPJ/YPG forces. It’s reported that YPJ/YPG forces tactically emptied the streets of Kobanê at town center and ambushed ISIS, neutralizing them with successful tactics. Everyone’s excited by what’s told at village meetings; one of them is ISIS’ fear of women guerillas. ISIS represents the state, the terror, the massacre and also the patriarchy of course. Because of their belief that they cannot be so-called “martyrs” when they get killed by a women guerilla, a YPJ fighter, they are scared of encountering YPJ forces. 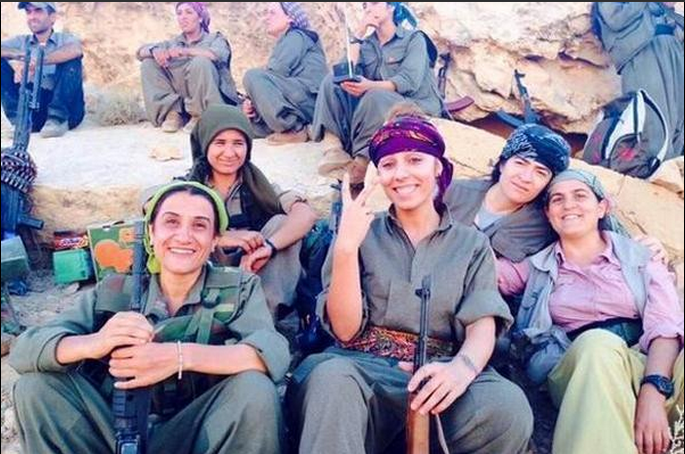 Because when they encounter them, the women who “fight” against them show no mercy to the ISIS lot. 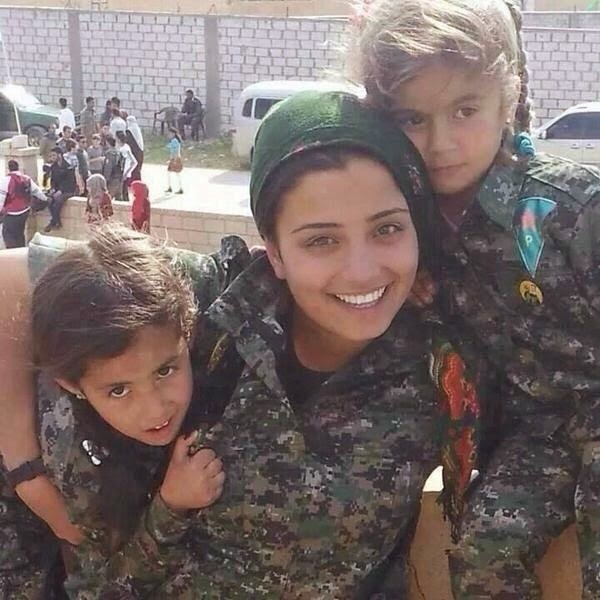 This is the freedom against patriarchy created by YPJ fighting. The rebellion that rises in all of Kurdistan and all cities of Anatolia in the last two days, makes us feel the invincibility of organized people. These rebellions increase the confidence in revolution for everyone in Kobanê, in villages at Kobanê border, and in all of Rojava. Whenever a sister or brother falls, although we feel the sorrow, it intensifies everyone’s anger and power here. Requiems that start with hitting on knees turn into halay dance with feet kicking fast and strong enough to crack the earth. Thus our sorrow bursts into anger, fast and strong. This is just what everyone needs here. For the freedom and revolution that’s craved, despite everything. Long live the People’s Kobanê Resistance! Long live the People’s Rojava Revolution! Long live our Revolutionary Anarchist Action! How you can help Kobane. The most important thing is that you help us to highlight what is happening in Kobane. Please speak! Share information. Support the aid organization if you can spare some money. To speak is to resist! To speak is to be visible. To speak is to exist! and existing right now for the Kurds is resistance and a revolutionary act. 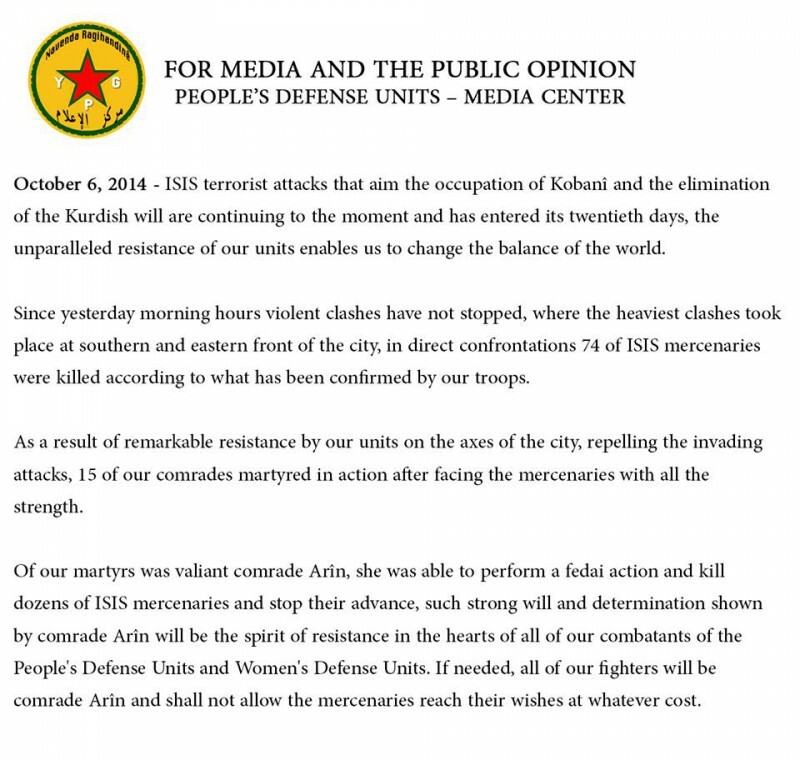 Please stand with us in speaking about Kobane as much as you can. 1-Rojava (Kurdish word for Sun-set is located in Syria, and is known as Western Kurdistan). This is where Kobane is located. 3-Basur (pronounced ba-sh-ur, is the Kurdish word for South and is south of Kurdistan in northern Iraq). This is where I am from. Thank you friends and feminists for standing in solidarity with us. Press release from the Y.P.J. Today we salute comrade Arin Mirkan also known as Deilar Kanj Khamis, of the Y.P.J. (Kurdish Women’s Defence Units) killed in action yesterday in defence of Kobani in Northern Syria against an armoured group of Islamic State (Daesh or ISIS). Arin performed a suicide operation, single-handedly holding her position with grenades and rifle fire until it was overrun, then detonated an explosive charge killing herself and several of the enemy, reportedly neutralising at least one tank. This action allowed her comrades to re-take the hill. She was the mother of two children. The Kurdish Peoples’ Defence Units have been fighting on this front for years using smallarms and improvised weapons, with no help from anyone and the active hostility of the Turkish state. Locals report that western airstrikes are ineffective and mis-directed, why? Given the political makeup of Kurdish forces being predominately revolutionary socialist and anarchist in character, we doubt Cameron and Obama want them to win. Press release from the People’s Defence Units (via twitter).